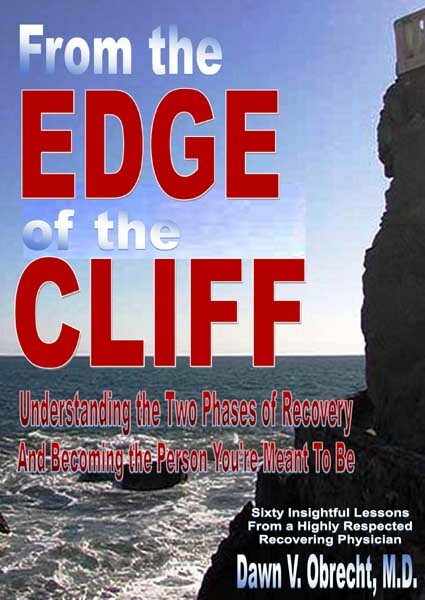 From the Edge of the Cliff: Understanding the Two Phases of Recovery and Becoming the Person You're Meant To Be :: Dawn V. Obrecht, M.D. The book contains an entire section on the hazards of drugs prescribed by physicians not well versed in addiction recovery. Read about the dangers of using "legal drugs" that may sabotage your recovery and trigger relapse. DocDawn's book is now available in audio book format! Listen or download at one of these fine merchants. What is being said about "From the Edge of the Cliff"
"...a very rare combination that isn't often present in publications. Your stories serve as lighthouses illuminating the rock on the way to a calmer harbor. Thanks for sharing this book with me." "It is rare to find someone, especially a medical doctor, who is willing to be open and honest ... her insights are enlightening and inspiring. You will learn much from Dawn in this book which is a must read for anyone who is willing to trudge the road less traveled." Allen Berger, Ph.D., author of "12 Stupid Things that Mess Up Recovery" and "12 Smart Things to do When the Booze and Drugs are Gone". "Dr. Dawn's message in this book is for non-addicts as well as addicts – recovering or not. Her profound approach has helped me understand what I can do and say to help the addicts in my life and myself. Buy this book to increase your understanding, no matter what side of the fence you are on!" Marsha Petrie Sue, MBA, professional speaker and author of "The CEO of You", "Toxic People", and "The Reactor Factor". "Once an addict, always in active addiction? The old lie is dead! This book provides clear instruction on how to recover and stay recovered from the disease of addiction. As an attorney who sees the legal ramifications of the disease of addiction, I recommend this book! Read and reread its' pages." "Dr. Dawn reveals how addicts can manipulate doctors so they become legal "pushers" and instruct physicians to educate themselves about addiction. This is a must read for any medical professional who has the ability to write a prescription. Thank you for your incredible and accurate insight, and also a great read!"